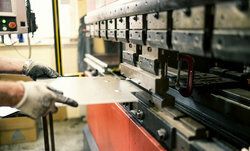 The CNC punching process besides giving general sheet steel requirements also has the advantage of being in full control of any forming needs (knock outs, hinges, cable tie fixing points etc). 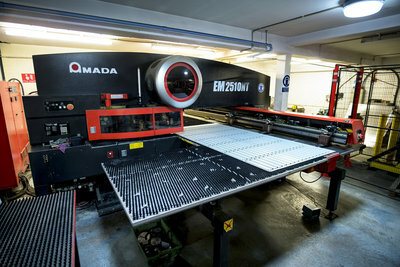 One bonus of the Metalforms CNC punching process is it has an automated sheet steel loading facility and also has the finished blanks immediately off loaded by robot part picking technology, which can reduce the cost on volume orders due to fully automated ‘lights-out’ production. Another advantage is our Amada off line programming software. 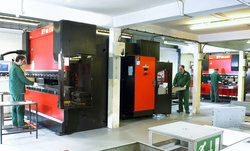 Our Amada CNC press braking can achieve up to 3 metres, all machines are linked to an Amada off line programming system which means less down time due to programming being achieved before even reaching the press brakes. 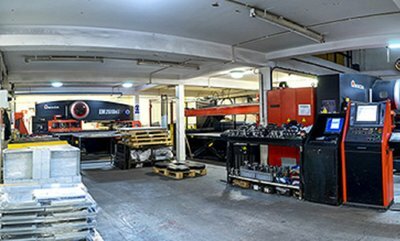 With a team of experienced programmers, setters and operators we have a long history of complexed press braking requirements.